Home Beers Dixie Brewing Co.
Dixie | Dixie Brewing Co.
Minhas has done a great job brewing this to taste like it did when produced at the New Orleans brewery until August, 2005 (Hurricane Katrina). Dixie is a good beer, and can (or could) be cloudy from time to time. It tastes different than any other beer, and has an excellent bite to it. It has an excellent mouth feel and goes down smooth. It's sad to drive by the large brewery on U.S. Highway 90 (Tulane Ave.) and see the once hopping building sitting derelict, but I guess that part of New Orleans history is over. 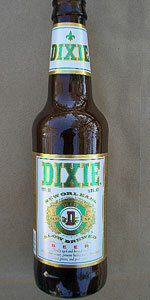 I've got a lot of admiration for Dixie beer. Pride of the South. Good alternative to Budweiser. Pours clear gold with a medium white head. Low aroma of grain and wheat, some cereal. Smooth taste, sweeter grain and corn, without the metal. This beer does not try to be something it is not. Cold, refreshing, and light. The first thing I noticed was that this beer was extremely flat. There was virtually no head or lace. The body is brass colored with hardly any bubbles. It smells a little bit like saltine crackers. The taste was pretty bland there was not much anything. There is a tiny bit of hops and it is mildly grassy. Very thin mouthfeel. I think I may have worked my way through must of their lineup now, LOL. I keep getting these just for the sake of trying them to be honest. I am in search of the macro lager that I actually like. This one was served cold and poured into a pint glass on 06/25/2009. The pour was about what I would have expected. Dull hay in color with lots of carbonation. A nice big head of fizzy white on top that only hangs around for a few moments before settling back down into virtually nothing. Dull aroma of musty bready notes with hints of light grain and a very light overall presentation. Taste is crisp, clean, and not long lasting. What is there is your traditional wet hay like flavor, hints of malts, and just the slightest bit of bite from a bitter note toward the end. Underwhelming but not really bad per se. Very light body, very light carbonation. Overall not bad at all, just painfully average and more along the lines of everything else out there. I would not really go here again. Purchased a bottle at State Line Liquors in MD. I was in New Orleans a few years back and didnt come across Dixie then so I decided to purchase. I believe it is now being contract brewed after Katrina. Bottle label states this beer is "slow brewed". I never heard that one before. Light golden color with about a half a finger head which quickly faded. Sweet and grainy smell. Macro taste. A sweet corn beer. It kind of reminds of Straub Beer. Drinkable but not something I would have except as a novelty or a cheap beer session. Man! I used to love this Dixie Beer! It's kinda weird to me now. Don't get me wrong, it is good. I just wish it was a bit better. It most likely has to do with the fact that it is not made in Louisiana anymore. Bummer. Anyway, it's a good beer to get when sitting outside on a nice day, sitting inside on a bad weather day, beachin' it with babes, eating gumbo, eating mudbugs, eating fried chicken, walking through the woods, fishing in a secret fishing hole, driving a tractor, listening to Taj Mahal, or really anything else. Get yer Dixie on! Pours a clear straw yellow with a fizzy one finger head. Tons of carbonation bubbles. Smell contains a good bit of corn and is fairly sweet smelling. A little more fruity than other AAL's too. Adjuncts are definitely detectable in the taste, predominantly corn. There is a little grain buried underneath, though. A light fruityness reminiscent of peaches comes through and the beer is pretty sweet throughout until a crisp finish dries everything up. Overall, a quite underwhelming beer. For the price, which is equal to many great craft brews around here, it is a big let down. Poured from a 12 OZ bottle into a pint glass Aroma- smells of rice and maybe yeast with a hint of citrus (?) Appearance- Light golden color with some cloudiness. This often foreshadows the flavor Taste- Yep, has a weak corn flavor. not the way I remember it 20 years ago. Palate- Medium bodied with a creamy texture. Overall- not good, this used to taste a lot better several decades ago. Enjoyed when I was in New Orleans. Can't find it up north. Dixie from Dixie Brewing Co.